Our butterfly bushes are shipped bare root and are currently 6-12'' They are well rooted, trimmed once or twice, and most will bloom this summer! By next July, they should be 3 to 4 feet high and attract butterflies (and hummingbirds) like a magnet. Butterfly bushes are hardy in zones 5 - 9. If you live in a colder zone, the tops in your butterfly bushes will likely die back over the winter. Even so, they will come back the next growing season bigger and better then before. Butterfly bushes prefer full sun (they must receive eight or more hours of sun a day to thrive). Buddleia 'Pink Delight' (Butterfly Bush)#89 Sun Zone: 5-10 Grows to 60" tall. Origin: Hybrid This hybrid from The Netherlands' Boskoop Experimental Station is absolutely one of the finest "pink" flowered cultivars on the market. The silvery cast to the foliage (especially evident fall through spring) and compact (5' tall x 6' wide) habit combine to make this a truly spectacular buddleia. B. 'Pink Delight' is topped with large 1' long flower heads from June until frost. 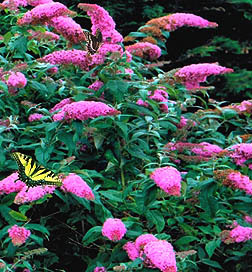 Tip: Cut faded flowers off a butterfly bush regularly to keep it blooming throughout the summer. Flowering: Blooming Growth Rate: Fast growth rate Light requirements: Full Sun Plant Group: Perennial, Shrub Plant Type: Deciduous Plant Zone: Zone 4, Zone 5, Zone 6, Zone 7, Zone 8 Size at Maturity: 6 - 10 ft Size at time of shipping: 6-12'' bare root.